You may receive updates from Lisa Rudley , the creator of this letter campaign. Please TAKE ACTION NOW and SHARE your stories with the NYS Education Department (NYSED) and Board of Regents. ASK them to CORRECT the MISINFORMATION being spread about test refusals, and to stop the bullying of our children. CLICK ON 'START WRITING' TO ADD YOUR STORY TO THIS TEMPLATE LETTER. Despite the fact that Commissioner Elia has acknowledged that parents have the right to opt out of the state tests, NYSAPE has been flooded with emails from parents sharing stories of misinformation being disseminated by their school districts regarding test refusals. Many stories detail intimidation and bullying, as well as false claims that schools or students will be punished for opting out. Here is the reality: NO student will have a low score entered into their records for opting out, NO school will be identified as failing because of high opt out numbers and NO school will lose funding. NYSED and the Board of Regents MUST HEAR from you regarding intimidation and misleading information being spread in your school district regarding your right to refuse the NYS Grades 3-8 state tests. Schools have a legal obligation to administer the state tests. HOWEVER, parents have the legal right to opt out their children free of coercion or penalties of any sort. We are imploring NYSED and the Board of Regents to address these issues! We refuse the state tests because we do not want to have our schools focus on test prep, and have our children subjected to biased, flawed exams. We demand that our schools focus instead on creating a meaningful, student-centered learning environment. If you’re in doubt about what to do, check out the video of one of our founders, Jeanette Deutermann, available here and from NYC Opt Out leader Johanna Garcia, available here. If you do decide to opt your child out of the tests, here's a NYSAPE TEST REFUSAL LETTER to send to your child’s teacher/s and building principal. Also, here's an excellent resource and FAQ from NYC Opt Out. Time is of the essence, as state testing is around the corner! 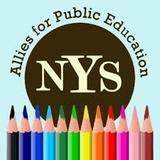 Please TAKE ACTION NOW and SHARE your stories with NYSED and the Board of Regents. ASK them to CORRECT the MISINFORMATION being spread about test refusals, and to stop the bullying of our children.